The cost of operating a humidification system includes two main elements. The energy required to turn water from a liquid to a gas and the cost of dealing with what’s left behind in the humidifier after this has happened. In order to reduce the operating costs of any humidification system both these elements needs to be examined. Let’s start with the electrode boiler steam humidifier. It is very popular as it is has the lowest purchase cost of any industrial humidifier. The energy required to create the steam comes directly from the current being introduced to the water in the tank. As it’s electrically powered, the energy costs are high. These humidifiers are easy to install, use and service due to their plastic, replaceable boiling cylinders. Once the limescale has built up to a level that makes the unit inefficient, the boiling cylinder is replaced with another. This does mean the cost of operating the system is expensive as boiling cylinders present an ongoing cost. To reduce this cost, resistive steam humidifiers operate without the need for replaceable boiling cylinders. The water is boiled using a resistive heating element and the tanks are stainless steel and cleanable. The energy costs are the same as electrode boiler humidifiers, as both use the same amount of electricity, but the maintenance is less expensive due to fewer consumable parts. 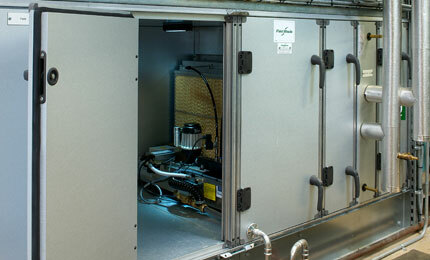 Some modern resistive steam humidifiers, such as the Condair Mk5, use innovative ways to deal with scale. A scale collector tank is located under the main boiling cylinder, which is easy to drain and remove. Scale falls into the tank and makes removal a simple 15 minute task. 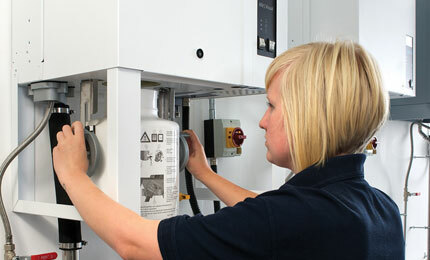 This further reduces the maintenance cost as it shortens the time needed to service the system. If gas is available on site, gas-fired steam humidifiers present a much more cost effective humidification solution than electric powered units. As gas costs around one third the price of electricity, using a gas-fired humidifier can significantly reduce the energy cost of a building’s humidity control. Gas-fired humidifiers start at around 40kg/h so applications requiring lower outputs than this could still find electric steam a better solution given the higher capital cost of a gas-fired humidifier. However, the higher the output, the faster the payback due to the increased savings in energy cost. Replacing a 100kg/h electrode boiler humidifier with a gas-fired system, operating 1,850 hours per year, could pay for itself in less than two years with savings thereafter. Gas-fired humidifiers are relatively easy to retrofit into existing steam humidifier installations as they can be connected to the existing steam lance pipe work, resulting in minimal disruption to the AHU operations. In the past gas-fired humidifiers have suffered from being difficult to service. However, modern systems, such as the Condair GS, incorporate several features to make them maintenance-friendly. In order to discourage scale build-up the Condair GS continually introduces a small amount of fresh water to the boiling chamber and drains water with high mineral content. By maintaining a low mineral content in the water tank, scale is minimised and the need to run a full drain to combat scale is removed. This in turn results in more consistent humidity control without a drop in output and a lower service requirement. To reduce humidification operating costs beyond that of gas-fired steam, cold water humidifiers should be considered. This could be either an evaporative or spray system. Rather than use a self-generating heat source to transform the water from a liquid to a gas, cold water humidifier use the thermal energy from the air. For each kg of moisture evaporated into the atmosphere 680W of energy is required. In steam humidifiers this energy comes from the electricity or gas supply but in cold water systems it comes from the heat in the air. So in addition to humidification, cold water humidifiers will cool the air as this thermal transfer happens. This is a very low energy form of cooling as an evaporative humidifier can provide hundreds of kWs of cooling from as little as 500W of electrical energy. The use of cold water humidifiers for low energy cooling is now often seen in applications such as data centres. In those humidity control applications where cooling is not required, a source of heat is needed to counter the cooling effect of a cold water humidifier. This is normally provided by gas heating, resulting in a total energy consumption of a cold water system equalling that of a gas-fired humidifier. Rather than heating the water directly, the gas is used to pre-heat the air so it can absorb the moisture emitted from the humidifier. Under these circumstances the cold water humidifier is as economic to power as a gas-fired humidifier but due to the much lower capital cost, it can provide a faster payback on the initial investment. If the application allows and there is an additional heat source available that can be recovered and used to pre-heat the air prior to humidification, the energy cost of a cold water humidifier can be a fraction of a gas or electric steam humidifier. Evaporative cold water humidifiers also present a saving in maintenance as the scale that is left behind after the moisture evaporates is washed to drain rather than collecting in a water tank. Less servicing means lower operating costs. However, there are limitations on retrofitting cold water humidifiers into an existing steam humidifier installation, as the space needed in the AHU to accommodate the unit is greater than is required for a simple steam lance. For those wanting a quick fix to humidification costs, reverse osmosis water treatment presents a good way to reduce maintenance costs and improve energy consumption. By removing the minerals from a humidifier’s supply water, scale build-up is virtually eliminated. This dramatically reduces the need to service the humidifier. In steam humidifiers, it also eliminates the need to drain water to combat mineral build-up. By conserving hot water, energy costs are reduced and as an additional benefit humidity control is improved as the water tank temperature is more consistent. Savings in maintenance and energy can pay for the installation of a reverse osmosis water filter in under a year. Want expert advice from David about reducing the cost of humidification?